This document applies to the Simplicité Instances Manager (SIM) software available on instances servers. Using the CLI offers the full features of the SIM, the API and the UI offers only a subset of the CLI features. All above actions are triggered manually using the CLI, the API or thee UI. Note that the automatic backup can be configured to export the backup files to a remote storage. Otherwise the backup files are only stored locally on the SIM server. Implementing pre/post action hooks (see bellow) allow you to customize the standard features of the SIM. The instances manager UI is available on <base URL>/ui. The UI offers uses the API documented bellow and thus offers equivalent - but somehow limited by a simplified user experience - services. The instances manager API is available on <base URL>/api. The API services are using HTTP GET methods only and URL-encoded parameters only. All API responses are JSON-encoded. For all API services, you can get a pretty printed JSON response by appending &prettyprint=true. The action parameter can be ommitted in this case as config is the default action. param (optional) the version for filtering. If you don't provide an explicit value no version-based filtering is done. name (optional) the name of the instance to create, must be strictly alphanumerical and of length 3 to 20. If you don't provide an explicit name, a random name (10 alphanumerical characters) is generated and used. param (optional) the version of the instance (e.g. 3.2) or the name of an existing instance to clone (e.g. sft65drt7y). If you don't provide an explicit version, the configured default version is used. name (required) the name of the instance to stop. name (required) the name of the instance to start. name (required) the name of the instance to get health check for. name (required) the name of the instance to get I/O credentials from. name (required) the name of the instance to get logs for. name (required) the name of the instance to download logs for. name (required) the name of the instance to get access logs report for. name (required) the name of the instance to upgrade. name (required) the name of the instance to reset. name (required) the name of the instance to delete. name (required) the name of the instance to clone. param (required) the name of the cloned instance. name (required) the name of the instance to rename. param (required) the new name of the instance. name (required) the name of the instance to save. name (required) the name of the instance to download data for. name (required) the name of the instance to download webapp for. name (required) the name of the instance to download. export JAVA_OPTS="$JAVA_OPTS -server -Dfile.encoding=UTF-8 -Dgit.basedir=$TOMCAT_ROOT/webapps/<instance|'ROOT'>/WEB-INF/git -Dtomcat.adminport=$TOMCAT_ADMIN_PORT -Dtomcat.httpport=$TOMCAT_HTTP_PORT -Dtomcat.httpsport=$TOMCAT_HTTPS_PORT"
name (required) the name of the instance to get action history for. 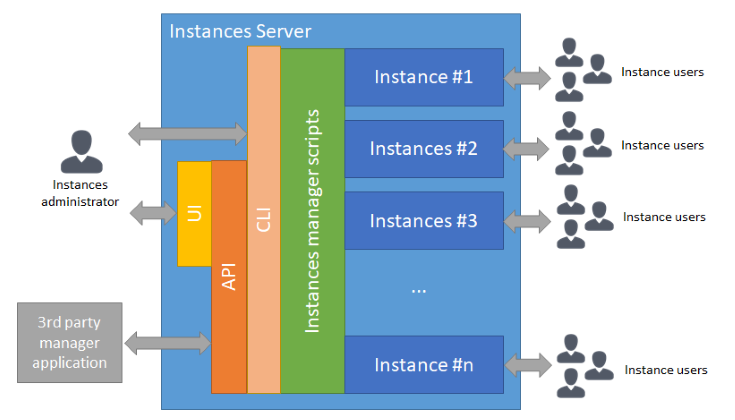 This applies only if the instances manager is configured to handle instance requests. The instances manager CLI is available on <base URL>/term if the web shell service is enabled on the server, otherwise a SSH client is required. The available actions are the same as the ones offered from the API services. sim list "SQL:i.version in ('4.0', '3.2') and i.status = 'started' and i.version_date < v.date"
Note: during the save action the Tomcat process, if running, is suspended to ensure saved data consistency. Using debug is similar to start except that the Tomcat server is then started in JPDA debug mode. The JPDA port is available as the JPDA_ADDRESS environment variable. If no module is specified all modules are analysed. All hooks receive as argument their caller script's arguments (e.g. instance name, version and options for pre/post-add.sh). Note: if your usage of the hooks is to add/alter elements to instances' Tomcat (configuration files, additional Java JARs or static web components, ...) you need to do it in the pre/post-add.sh but also in the pre/post-upgrade.sh (and maybe also in the pre/post-reset.sh) as upgrade (and reset) actions reinstall Tomcat. echo "Failed to import $XML: $RES"
An optional API and UI gateway is also available to wrap the above CLI. Note: at that stage the Docker instances relies on the various Simplicité Docker base server images and only supports Traefik as reverse proxy. The above hooks are not applicable. Warning: these system settings SHOULD NOT be changed unless you know precisely what you are doing. The instance-level settings are set as environment variables in the <instance home>/.simplicite file (with the export keyword). Some of them such as SERVICE_TOMCATMINMEM/SERVICE_TOMCATMAXMEM overrides globals or version settings. Warning: these variables are set upon creation of the instance and should not be changed manually unless you know what you are doing.